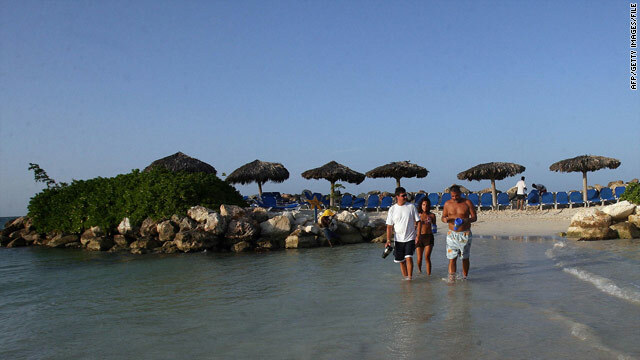 Tourists walk on a beach at a resort in northwest Jamaica. The country is heavily dependent on tourism. (CNN) -- As the tourist-brochure images of Jamaica as a friendly, reggae-infused tropical paradise become overshadowed by footage of gang violence in the capital, many tourists may be wondering whether it is safe to stay on the island or go for a vacation. Unrest surrounding the planned extradition of an alleged drug kingpin prompted Jamaican authorities to declare a state of emergency in parts of Kingston on Sunday. Meanwhile, the U.S. State Department has issued a travel alert for Jamaica, warning U.S. citizens against travel to Kingston and its surrounding areas because of escalating violence. Still, both travel experts and officials from Jamaica's tourism industry said that as the situation stands now, visitors should feel little impact of the unrest if they stay in the island's most popular resort areas. They include places like Montego Bay, Ocho Rios, Negril, Port Antonio and the south coast, said John Lynch, Jamaica's director of tourism. "People are having a great time there. We had a great weekend, most of the hotels were full," he said. But he acknowledged that some people are rearranging their trips because of the violence in Kingston and expressed concern that the situation would have a negative effect on tourism in Jamaica, an industry he called "very, very, very crucial." Travel and tourism account for a quarter of Jamaica's gross domestic product, according to the World Travel & Tourism Council, and the country markets itself aggressively as a vacation hotspot. But for some travelers, the violence in Kingston may deepen existing concerns about overall safety on the island. "Jamaica is a challenge to sell on a good day," said Terry McCabe, national director of leisure for Altour in Paramus, New Jersey, adding that many visitors are turned off by some of the aggressive hawking on beaches and other image problems. "When I talk to a new client, I'll say to them, 'What do you like, what don't you like, and before we start working on this process, are there any places you won't consider?' Ninety-eight percent of them say to me Jamaica." Crime, including violent crime, is a serious problem in Jamaica, according to the U.S. State Department. The primary concern for tourists is theft, it says, adding that in several cases, armed robberies of Americans have turned violent. Still, 1.8 million tourists came to Jamaica last year -- about two-thirds of them from the United States, according to the Caribbean Tourism Organization. Since the unrest began in Kingston, travel agents like Becky Veith with Travel Experts in Erie, Pennsylvania, have been getting lots of questions from worried clients who are scheduled to vacation on the island in the upcoming days and weeks. "I have clients who are going to Jamaica in June, and they e-mailed me and said, 'What should we do, should we cancel our trip because of the civil unrest in Kingston?' " Veith said. "I e-mailed them back and said no. ... I wouldn't be afraid to go to Montego Bay. I wouldn't go to Kingston, though, but I wouldn't go to Kingston at any time." Travel agents emphasized that the capital is several hours away by car from the resort areas and that few travelers ever make the city a destination. "It's virtually nonexistent on the tourist level," McCabe said. Most people who fly into Kingston visit friends and relatives or are there for business, she added. Veith said she has never sent anyone to Kingston, calling it "not a good place to go." The city has a history of some unrest, added Brooke Ferencsik, a spokesman for TripAdvisor.com. Travel experts urged travelers to Jamaica to follow the situation closely, but not to let the turmoil in Kingston automatically taint the rest of the island. They compared the situation to recent violence in Mexico, which has been centered near the country's border with the United States but has affected tourism in Cancun and other popular spots far away from the unrest. "It would be like me saying I can't go to the United States because there are murders in New York City," Veith said. If you are thinking about booking a trip to Jamaica, consider travel insurance, Ferencsik advised. It's a good additional safeguard during unpredictable circumstances because it gives you the leeway to rebook during a time where you might be more comfortable traveling, he said. "Jamaica still has so much to offer. Those terrific resorts like Montego Bay, Ocho Rios -- they will continue to bring in travelers," Ferencsik said. "And travelers, while staying on top of the news, should feel comfortable going to those spots."